What is a Denver omelet? Almost everyone agrees that it should have chopped onion and chopped bell pepper cooked into the egg (preferably a combination of red and green bell pepper). Most people would expect small cubes of ham in there too. Whether or not it should have cheese as a filling or a topping is up for debate. 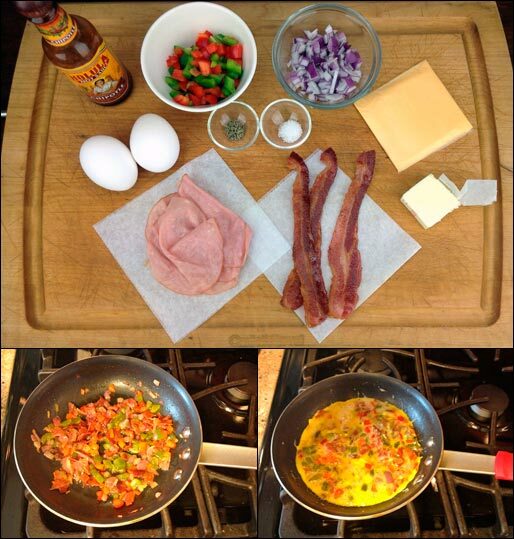 The recipe submitted here is sort of a Meat Lover's Denver Omelet. It includes crispy, crumbled bacon with the ham and vegetables. 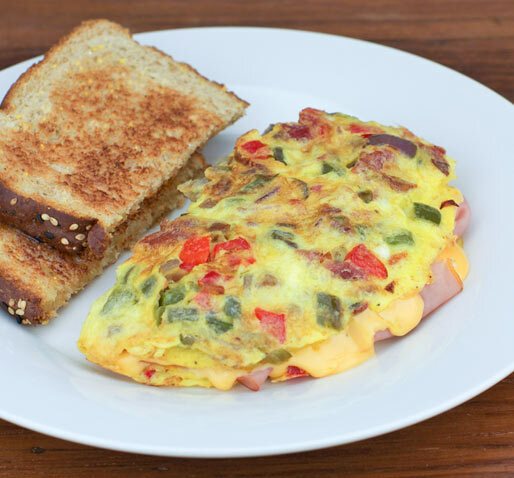 For more of a purist's Denver Omelet, just skip the bacon. 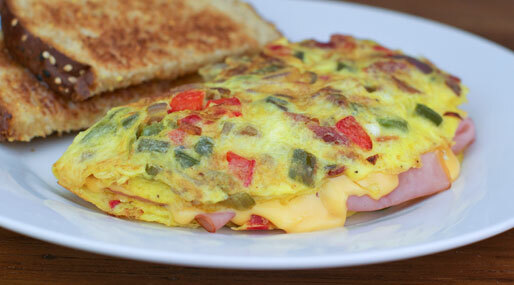 The Denver Omelet recipe above works great and has received some very good reviews. When I made it, I switch up the ingredients just slightly based on what I had around. Instead of using chopped ham, I filled the omelet with very thinly sliced deli ham and 1 slice of American cheese. So the ingredients I used for one omelet were 2 eggs, 1/4 medium red bell pepper, 1/4 medium green bell pepper, 1/4 medium onion, 3 slices of crumbled bacon, 4 slices of thinly sliced ham, 1 slice of American cheese, 1 Tablespoon butter and a little salt and pepper. You can omit the bacon for a more traditional Denver Omelet... but I like mine kinda meaty (sometimes I even add a slice of American cheese). Recipe number 1426. Submitted 2/7/2005.